Restoring your smile with modern techniques and state-of-the-art equipment. Achieve natural looking teeth with our dental crowns in Woburn, MA. When it is necessary to rebuild the physical structure of a damaged tooth to improve its appearance or increase its strength, we often recommend a dental crown. A dental crown is designed to look like a natural tooth. Your Woburn dentist places a crown on top of any tooth that requires a full restoration. Like a cap, the dental crown covers all visible portions of the tooth and fits right down to the gum line for maximum coverage. They are commonly made of porcelain. The dental crown process begins with the reshaping and adjusting of the tooth. Impressions are taken of the reshaped tooth to serve as a 3-D blueprint for the permanent crown that will be fabricated in a dental lab. 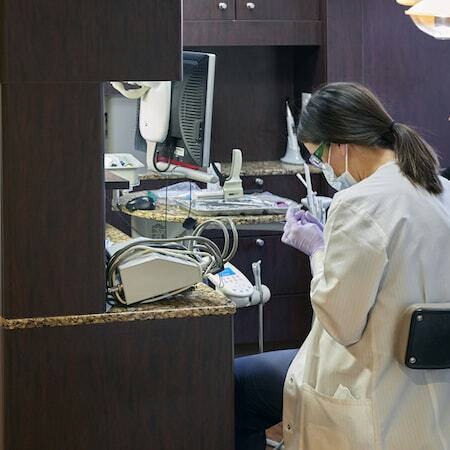 While the lab work is in progress, your tooth will be fitted with a temporary crown. When the completed crown is ready it will be seated, adjusted, and cemented into place. Recently had a small emergency with a crown, they were fantastic in scheduling me and taking care of the issue, Michele and Dr. Mancuso were professional and caring. I have been coming here for years and they always (and I mean always) treat me with respect and prompt service. Ideally and discreetly replacing your missing tooth. A dental bridge is a permanent or “fixed” series of crowns that are joined together to extend across the void of a missing tooth. Two or more natural teeth or dental implants may support the bridge. There are functional advantages to be gained from replacing a missing tooth with a dental bridge. Bridges can improve your chewing and speaking as well as prevent the shifting of your bite, which can lead to advancing jaw joint complications. There are also several cosmetic advantages offered by dental bridges such as the elimination of gaps and shifting teeth, which are the common result of tooth loss. The teeth that will support the bridge on either side of the missing tooth will need to be reshaped and reduced in size so that the crowns on each end of the bridge can slide over them, essentially capping them. Similar to the steps required for a single crown, dental impressions will be taken to serve as the mold for your permanent bridge, followed by a temporary bridge, and the seating of your permanent bridge. Talk with our dentists about bridges and dental crowns in Woburn, MA.